Qlik's unique approach to data, reporting and analytics flipped all of my 80/20 rules upside down. As the divisional CFO of a $2 billion portfolio, we built 3 Finance "apps" that put 63 spreadsheets, SSRS Reports, Crystal Reports, Business Objects and Access databases on the hook to be retired. After we rolled the apps into production, I attended a Qlik Financial Services "Customer Council" in New York City and was pleasantly surprised to learn that similar transformations were occurring across the industry, at companies such as Citigroup, JP Morgan Chase, Barclays Capital and AIG. I have been blessed with a string of key mentors, managers and co workers that have positively influenced me. Jose Garcia (Bank of America) took a chance on me and supported an early turn into transforming business teams with data & analytics. He instilled the importance of executive sponsorship, gaining consensus and relationship building. My passion for pricing, modeling & analytics was molded by Andy Westhoff (Bombardier Capital) who I watched save a business by modeling, implementing and enforcing a strategic pricing program. Andy pushed me to even greater heights by encouraging & supporting my quest for a master's degree at the University of Florida. A very successful and rewarding partnership was with Patrick Nussbaumer (who now works for Alteryx). We collaborated on a Qlik implementation that was delivered on time, under budget and ultimately transformed how our organization used data. He reinforced my belief that tireless dedication to continuous improvements always pays off. 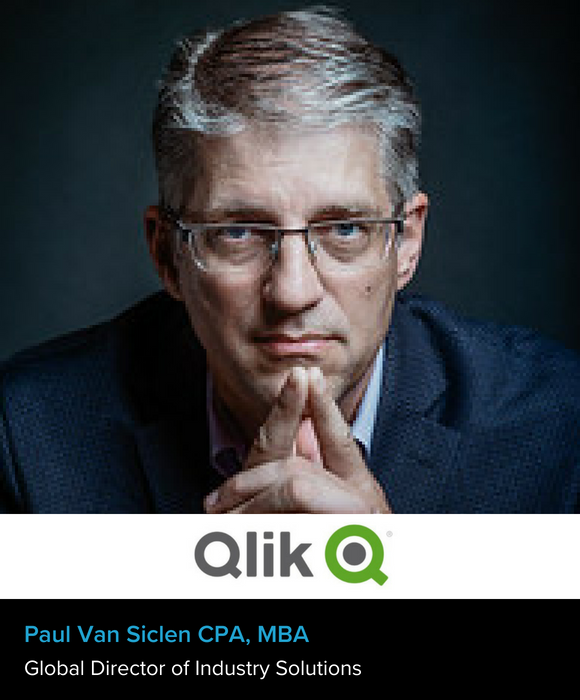 Finally, Mike Saliter and many of the other leaders at Qlik have supported my transition from a Finance/Accounting career to the software/technology industry. Mike's ability to keep an organization focused on achieving (and exceeding) its goals is inspiring and a model I hope to replicate throughout my career. We are seeing a tremendous amount of momentum in Finance & Accounting use cases. I have put together a new solution that demonstrates the ways that a modern analytics platform transforms the finance & accounting roles on multiple levels. Traditional, static, query based reporting & analytics have a number of natural bottlenecks that finance organizations have simply accepted (and worked around) over the years. However, Geoffrey Moore's analogy of "Crossing the Chasm" is currently in flight and the traditional query based approach is being disrupted in a holistic & innovative way. API's (Application Programming Interface) open integration possibilities with best in class technologies. Whether it is running a Python algorithm on the fly while interrogating your analytics application, or calling visualizations directly into a modern CRM platform such as Salesforce, the opportunities to maximize the value of analytics solutions by extending them beyond the traditional user interface is an entirely new and exciting frontier. We are in the midst of a data & analytics revolution, be a change agent.